Raising chickens can be a rewarding and fun project for a family. Chickens produce delicious eggs, keep insects and pests under control and can provide family pets with surprising personalities. As a family project, chickens can also teach kids about nutrition, organic gardening (chicken manure makes a great fertilizer!) building small projects (chicken coop and enclosure) and biology. Even if you’re in a relatively rural setting, your town or municipality may have very specific regulations and zoning regarding raising chickens. Some towns allow hens but not roosters— not to worry: hens will lay without the presence of a rooster. One collection point for information about local chicken ordinances is BackyardChickens.com. Their New Laws and Ordinances page has links and downloaded info on the ordinances and laws for many areas around the country. You can also check with your local town hall to get a copy of the regulations concerning raising chickens. Springtime is the time to place your order for chicks at your local farm and feed or hardware store. Some websites, such as mypetchicken.com also offer the option of ordering chicks online. You can select the chicks based on availability date. You should coordinate the arrival date with a time when weather is moderate enough for chicks to arrive safely. If possible, order from a supplier that is closer to your location and at the time of year when cold weather is no longer a big issue. Your local farm store can help with the timing, or check out the forums on backyardchickens.com. Chicks need to be kept warm in the first few weeks until they feather out. 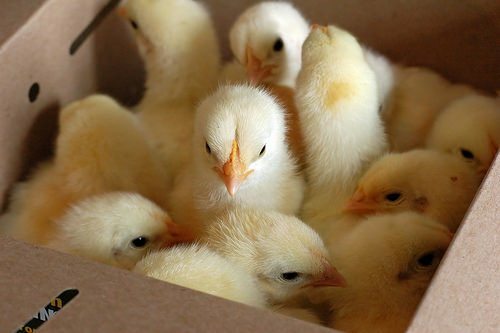 Their brooding box can be a sturdy cardboard box or small rabbit cage. The temperature to start out with should be a constant 90-100 degrees for the first week, and decreasing by 5 degrees each week after that. 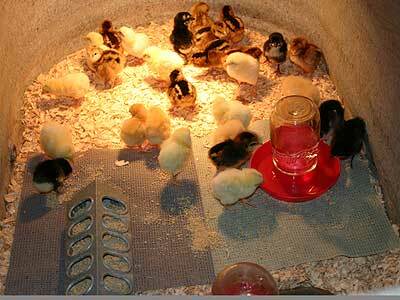 A 100-watt light bulb placed in one corner of the brooder should provide enough heat. Pine shavings are the optimum bedding and a chick waterer and feeder complete the brooder. Chick crumble feed or starter mix can be found at the feed/farm store. 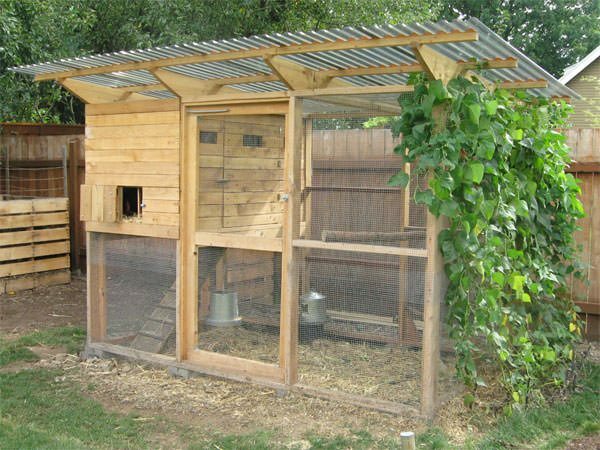 Housing your chickens can be accomplished in a simple shed or a fancy, funky chicken house. The chickens don’t much care about architecture, but if a building project is not your forte you may want to check out Horizon Structures, which makes and delivers fully assembled chicken coops, or kits for the buyer to assemble. 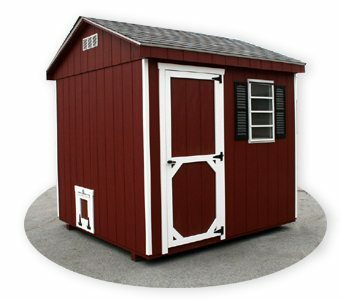 Their chart guides the viewer to the right size based on the number of chickens and nesting boxes, cost and customization available. As far as sizing goes, you’ll want to allow 2-3 square feet inside per chicken and 4-5 square feet per chicken in an outdoor run. Chickens scratch a lot. This means they can and probably will remove any grass within their run, and may develop an interest in other plants and gardens. Chickens produce a lot of manure. Chicken manure is an excellent fertilizer once composted, but you will need to collect it on a regular basis. Chickens can keep certain pests and bugs away. Grubs and the larval forms of some pests are very tasty for chickens, and can help to keep an organic vegetable garden safer from outside attack. Chickens need calcium for egg production. Make sure they have free access to oyster shell, which is available in large bags at the feed store. Protect your chickens from predators. Even city chickens need protection from the critters that can be found in both urban and rural settings. Ask around your area to find out just what you need to be prepared and protect from be it raccoons, foxes, coyotes or dogs. Some chicken breeds are better than others. There are dozens of different breeds with great looks and colors. When you’re starting out, it’s probably wise to select by climate hardiness and depending on your use, egg or meat production. The tool on this page allows you to narrow the choices based on different parameters.